The process of wedding planning can be tricky and you may find yourself in situations that fill you with guilt. Don't worry, you're not alone! 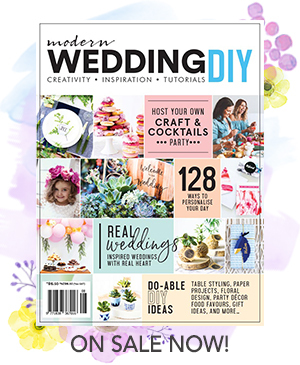 Modern Wedding are backing you up and telling you that these are the things you shouldn't feel guilty about when wedding planning. Maybe your friends are having extravagant weddings or have over 300 guests, but that doesn't mean you have to. Your wedding should be what you want and your guest list should be based on who you want there. Remember, just because a wedding is bigger, doesn't mean it's better. Don't feel guilty about the numbers or your guest list decisions. That is for you and your partner to decide! Plus one's can be very tricky! Unfortunately this is a topic that can spark hurt feelings, arguments and big feelings of guilt. These decisions should be made on a case to case basic. Don't feel guilty about not allowing everyone to have a plus one. Focus on celebrating with the ones you love! This is a big one. Whether it's someone else trying to take control of the planning or telling you which wedding dress you should buy, you can absolutely say no. The final decision for their important wedding choices is yours. Just remember to do so in a nice way! Weddings can be very pricey and handling the finances can be challenging. Whether you are asking your parents to assist you with the funds or accepting an offer of financial help, don't feel guilty about it. Those offers come to you from a place of love and are a wonderful gift that you shouldn't feel guilty about accepting. There will always be wedding traditions and constantly changing trends. You may be persuaded into thinking that you have to follow the latest wedding trends but you absolutely do not! Plan your wedding to be exactly what you want and don't feel guilty about not following the crowds. This is one element of planning a wedding where there can be a lot of guilt...the bridal party. Who will be your maid of honour? How do you pick only three bridesmaids? What if someone feels left out? Of course you want to avoid hurting peoples feelings but you have every right to choose the wedding party that suits your day. The trick is to kindly explain the situation to those involved. Chances are they will be very kind and understanding if you simply explain. If you still wish to involve someone in another way, ask them to play a role in your ceremony or reception instead. Maybe the flowers haven't turned out to be exactly what you imagined or the cake wasn't quite the colour you wanted. Everyone will tell you that it doesn't matter and while these little things won't make or break the day, they may still upset you. There is nothing wrong with wanting your day to be perfect but just remember to be flexible and accept that there are some things that you can't change. Planning a wedding is a very exciting time! Of course you will want to talk about it, that's only natural! Don't feel bad about wanting to share that joy with your loved ones. Just remember to chat about them too. See more of our top wedding planning advice here!